Indigo Nintendo GameCube with controller. The Nintendo GameCube (Japanese: ニンテンドーゲームキューブ), officially abbreviated GCN in North America and Europe or NGC in Japan, is Nintendo's sixth-generation home console. Codenamed "Dolphin" during development, the console was released on September 14, 2001 in Japan, November 18, 2001 in North America, May 3, 2002 in Europe, and May 17, 2002 in Australia. The system features a more compact design with four controller ports, a controller with an ergonomic design, small but large-capacity discs, connectivity with the Game Boy Advance and a form of online play. In 2006, it was succeeded by Wii, which also features ports for most GameCube hardware as well as compatibility for its software on original models. Nintendo discontinued manufacturing in 2007. The Nintendo GameCube was released in four colors. At launch, only the Indigo and Jet Black models were available. Later, in November 2002, a limited edition Platinum system was launched. Finally, in Japan only, a "Spice" orange console was released, though controllers of the same color were released in all regions. Overview and labeling of the Nintendo GameCube's external components. The Nintendo GameCube is the first Nintendo console to use optical discs as the primary format for games. Games on the system use 3.5 inch (8 cm), 1.5 GB proprietary miniDVD discs, and as such the system cannot play audio or video discs. As the system plays disc-based games and the console itself has no internal memory, the Nintendo GameCube requires a proprietary Memory Card for saving game data, which saves data in "blocks". The system has two slots for compatible Memory Cards; while three official size options were released, third-party Memory Cards were also manufactured. While the system will automatically play the inserted game after powering on, the player can access the system menu by holding down the A button during startup, or by starting the console without a Game Disc inserted. From the system menu, the player has one of four options, accessed by tilting the analog stick in the appropriate direction. By tilting up, the player can play the currently inserted game. The Nintendo GameCube is the first Nintendo system to feature a built-in internal clock, which can be accessed and adjusted by tilting the analog stick to the right. By tilting down, the player can view the data on the two currently plugged in Memory Cards, and copy or move data to the other Memory Card or erase data. On the left is the Options menu, where aspects such as the sound output (mono or stereo), the screen position, and language can be adjusted. Like the Nintendo 64, the GameCube features four built-in controller ports. On the top of the console are three buttons: Power, Reset (which resets the current game), and Open (which opens the disc cover on the top of the console). On the top of the disc cover is a name plate, which can be removed and replaced on early model consoles, and in front of the cover is an LED to indicate the console is powered on. Opening the disc cover is the laser lens and the disc release button, which is where games are placed and can be pressed to remove the disc. On the back of the console is a handle, which allows for it to be conveniently carried, as well as the DC input for the AC Adapter (DOL-002), and the video output port(s). On the bottom of the console are three expansion ports for add-ons: one hi speed port and two serial ports (later models would remove the second serial port). 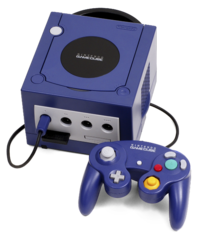 The Nintendo GameCube can natively output analog video at 480i resolution through the Stereo AV Cables or S-Video Cables, used by both the SNES and Nintendo 64, which output through the 'Analog AV Out" port, or using the RF Switch by plugging the RF Modulator into the port. Japanese and PAL systems can also use the RGB Cable. Model DOL-001 consoles also support 480p video output, using the Component Video Cables (sold at retail exclusively in Japan, though component cables could be purchased on Nintendo's online store in other regions), or, in Japan only, the D-Terminal Cable; both of these cables use the "Digital AV Out" port, which was removed on later consoles, and the Analog AV Out port is still required for audio. Several games have optional native support for "progressive scan" mode by holding down the B button as the game boots up, allowing the game to display at 480p; this is only necessary the first time the game is being played in progressive scan mode, however, as the game will automatically display the prompt every time afterward if using 480p-compatible cables. Some Nintendo GameCube games also support 16x9 widescreen display. Finally, in the PAL region only, several games support "PAL60" mode, which allows games to be played on more modern 60Hz displays. Stereoscopic 3D technology was built in to the hardware, and would have used an accessory to enable it, but the accessory was never released as 3D-compatible televisions were not widespread, and the accessory would have been too expensive. Notably, only Luigi's Mansion was developed with support for stereoscopic 3D. Graphics processor: 162 MHz ATI "Flipper"
Image processing functions: Fog, subpixel anti-aliasing, 8 hardware lights, alpha blending, virtual texture design, multi-texturing, bump mapping, environment mapping, MIP mapping, bi-linear filtering, trilinear filtering, anisotropic filtering, real-time hardware texture decompression (S3TC), real-time decompression of display list, HW 3-line deflickering filter. 661 games were released for the Nintendo GameCube in its six year lifespan. For the system's Japanese launch, three games were available, while for the North American launch one month later, twelve titles were available, and twenty were available in Europe. The Nintendo GameCube Controller is the primary controller for the console, one being included with each system and in the same color as the system. While the controller makes use of all the standard buttons of the Nintendo 64 and SNES, it also features a second control stick, as well as a more ergonomic design. The Wavebird Wireless Controller is a wireless alternative to the standard Nintendo GameCube controller, connecting to the console via a wireless radio receiver that plugs into a controller port. While it features the same design and buttons as a standard Nintendo GameCube Controller, it does not feature the built-in rumble feedback. The Nintendo GameCube Action Pad is a dance pad peripheral released by Konami exclusively alongside Dance Dance Revolution: Mario Mix. The Action Pad has many of the same inputs as a standard GameCube controller, but lacks L and R buttons. Two versions of the pad were released. The DK Bongos are a controller shaped like a pair of bongos. The controller features four buttons: the two drums, a "Start/Select" button, and the microphone. As the name implies, the bongos are primarily used for Donkey Kong games, namely the Donkey Konga series and Donkey Kong Jungle Beat. The Game Boy Player is a system add-on that allows the Nintendo GameCube to play Game Boy, Game Boy Color, and Game Boy Advance games. The console works by plugging it into one of the hi-speed ports on the bottom of the system, and uses most of the internal hardware of the Game Boy Advance, thus also making it compatible with most of the Game Boy line's accessories. Because of the changes in design for the Panasonic Q, a special Game Boy Player was released exclusively for use with the system. The Nintendo GameCube Modem Adapter and Nintendo GameCube Broadband Adapter are two add-on adapters for the Nintendo GameCube. Plugging into Serial Port 1 on the bottom of the system, the adapters feature an ethernet cable port and allow for the system to connect to the internet to play against other players, or to another console locally for LAN play; the Broadband Adapter allows for broadband connectivity while the Modem Adapter allows for 56k connectivity. The ASCII Keyboard Controller is a keyboard controller released only in Japan. While the controller keeps the same basic design and the same buttons as a standard controller, the ASCII controller is stretched to include a full keyboard, with the buttons on both ends of the controller. The controller requires two controller ports to be used. The Nintendo GameCube - Game Boy Advance Link Cable is a special link cable that allows for a Game Boy Advance system to be used with compatible Nintendo GameCube software. The Game Boy Advance can either be used as a second screen or a controller, or to unlock or use features in certain games. The Nintendo GameCube Microphone is a microphone accessories that allows players to use voice commands in compatible games. The microphone plugs into one of the system's memory card ports. The game Odama also features a clip which attaches the microphone to the controller. The Panasonic Q is an alternative version of the Nintendo GameCube hardware capable of DVD playback. The system was manufactured by Panasonic under license from Nintendo, as part of Panasonic's agreement with Nintendo to manufacture the Nintendo GameCube's optical disc drive. The two companies first agreed to develop a Nintendo GameCube with a DVD player in May 1999. The Panasonic Q was released on December 14, 2001, exclusively in Japan. Before the system's launch, Panasonic stated that the company had no plans for a North American release. Following the price drop of the standard Nintendo GameCube in mid-2002, Panasonic also announced that the Q would receive a price drop. The system was announced to be discontinued in December 2003, presumably due to low sales. 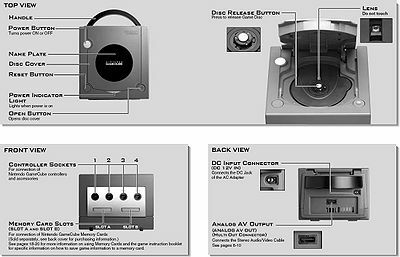 DOL-101 consoles do not have a "Digital AV Out" port, as Nintendo found that less than one percent of Nintendo GameCube owners used the component output feature. Serial Port 2, located on the right side of the bottom of the console, was removed. The nameplate on the disc cover cannot be removed. The Nintendo GameCube firmware was updated. The AC adapter is 48 watts rather than 46. Platinum DOL-101 consoles feature black plastic over the rear ports rather than platinum. Compared to Nintendo's other home consoles, the GameCube sold rather poorly. In total, less than 22 million units were sold, mostly in America. Although this was more than the ill-fated Dreamcast, Microsoft's XBox and especially Sony's PlayStation 2 outsold it. The GameCube was hurt by several factors. One of them was its image as a "kiddy" console, in a market that was being increasingly dominated by older audiences and games with "Teen" and "Mature" ratings, such as Grand Theft Auto. Unlike its competitors, the GameCube lacked the ability to play DVDs and online play. Although it managed to sell ahead of the Xbox from 2001 to 2003, a lack of new titles caused the system to climax long before its competitors. Despite the subpar sales, the GameCube and many of its titles have received critical acclaim. IGN rated the GameCube the 16th best console of all time, citing its impressive technology and great titles. It had a total of 41 titles to sell over one million units, including three to exceed 5 million sales. The best selling game on the system, Super Smash Bros. Melee, is also among the top best-selling fighting games of all time. Some GameCube games, such as Metroid Prime, Resident Evil 4, and The Legend of Zelda: Twilight Princess, are considered to be some of the greatest games ever made. ↑ Nintendo announces Platinum GameCube. Nintendo World Report (July 24, 2002). Retrieved April 12, 2016. ↑ 2.0 2.1 Q for Christmas in Japan. Nintendo World Report (October 19, 2001). Retrieved February 27, 2017. ↑ No Q for the U.S. Nintendo World Report (November 2, 2001). Retrieved February 27, 2017. ↑ Panasonic Drops Q Price. Nintendo World Report (July 1, 2002). Retrieved February 27, 2017. ↑ Panasonic Q Discontinued. Nintendo World Report (December 17, 2003). Retrieved February 27, 2017. ↑ 6.0 6.1 Nintendo GameCube Component Video Questions. Nintendo Customer Service. Retrieved April 12, 2016. ↑ 7.0 7.1 GameCube model comparison. megamanworld.com . Retrieved April 12, 2016. ↑ vgchatz.com. 2011. "Hardware titles". Accessed 2011. http://www.vgchartz.com/hardware_totals.php. ↑ vgchatz.com. 2011. "Software Totals". Accessed 2011. http://www.vgchartz.com/worldtotals.php?name=&publisher=&console=GC&genre=&minSales=0&results=50&sort=Total. This page was last edited on 28 October 2018, at 23:23.